Government intervention has messed up the healthcare sector, leading to needlessly high prices and massive inefficiency. Fixing the mess won’t be easy since it would involve addressing several contributing problems, including Medicare, Medicaid, the healthcare exclusion in the tax code, Obamacare, and the mess at the Veterans Administration. But at least we know the right solutions. We need entitlement reform and tax reform in order to restore a genuine free market and solve the government-created third-party payer crisis. And to bolster the case for reform, we’re going to look at three new examples of how government intervention makes the healthcare system worse rather than better. For our first example, let’s look at a new report from the National Center for Policy Analysis, which compares what happens when the federal government decides to build a hospital with a similar project constructed by a local government with private-sector involvement. We’ll start with a look at Veterans Administration project. …the VA hospital in Denver, Colorado, was run-down, crowded and outdated. …the VA considered renovating the medical facilities of the Fitzsimons Army Medical Center at a cost of $30 million. Then, the University of Colorado Hospital offered to open jointly-operated facilities for $200 million. VA officials passed on both ideas due to cost concerns. Instead, officials sought and received approval for a stand-alone facility. That decision was very costly for taxpayers. The VA failed to produce a design that could be built for its budget of $604 million, ultimately causing a budget-busting $1 billion overrun. 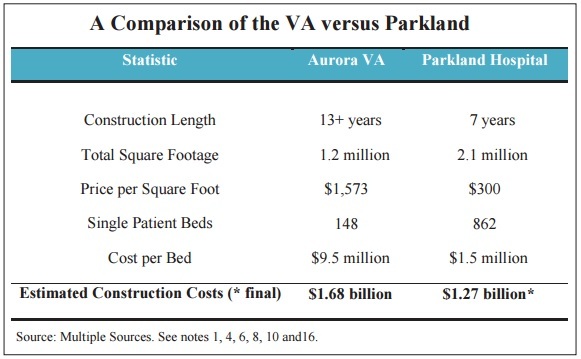 …Soon, the plan to build an affordable replacement morphed into the most extravagant and expensive hospital construction project in VA history. And, as is typical of government projects, the cost to taxpayers was far higher than initial estimates used to justify the project. Now let’s look at another project, this one in Dallas, Texas. …the original Parkland Hospital was built in Dallas to serve the young city’s indigent population. …its aging facilities could no longer meet the demand of 1 million patients admitted each year. …The project to rebuild Parkland, split roughly 60/40 in revenue sources, was accountable to both the public and its private donors. …Project managers hired an independent auditor to monitor all project transactions. Budget progress reports were made available to both Parkland’s Board and the public. The final outcome was far from perfect (after all, local governments are also quite capable of wasting money). But the involvement of the private sector, combined with the fact that the local government was spending its own money, created incentives for a much better outcome. On the first day of construction, Parkland’s project team was $100 million over budget. But a flexible design, and a willingness to balance needs and wants, allowed the team to deliver a larger, more cost-effective hospital than originally conceived for a mere 6 percent increase in budget. 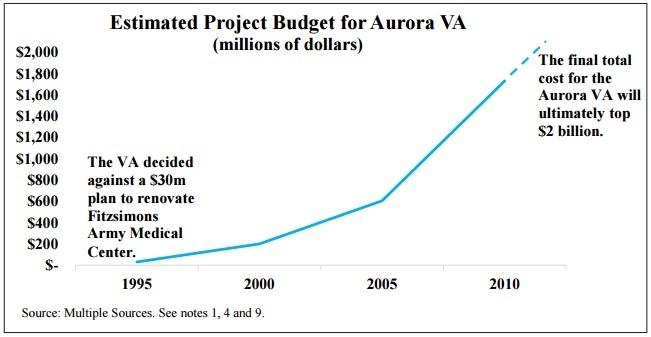 And here’s a chart from the NCPA report that perfectly captures the difference between the federal government and a project involving a local government and the private sector. Can you think of a better argument for local private-public partnerships over the federal government? Yet policy keeps moving in the wrong direction in Washington. The Obamacare boondoggle was all about increasing the federal government’s control and intervention in the healthcare sector. And this brings us to our second not-so-great example of government-run healthcare. The New York Times has a story with a real-world example showing how the President’s failed legislation is hurting small businesses. LaRonda Hunter…envisioned…a small regional collection of salons. As her sales grew, so did her business, which now encompasses four locations — but her plans for a fifth salon are frozen, perhaps permanently. And why can’t she expand her business and create jobs? Because Obamacare makes it impossible. Starting in January, the Affordable Care Act requires businesses with 50 or more full-time-equivalent employees to offer workers health insurance or face penalties that can exceed $2,000 per employee. Ms. Hunter, who has 45 employees, is determined not to cross that threshold. Paying for health insurance would wipe out her company’s profit and the five-figure salary she pays herself from it, she said. And Ms. Hunter is just the tip of the iceberg. For some business owners on the edge of the cutoff, the mandate is forcing them to weigh very carefully the price of growing bigger. “There’s kind of a deer-in-headlights moment for those who say, ‘I have this new potential client, but if I bring them on, I have to hire five additional people,’” said Philip P. Noftsinger, the payroll unit president at CBIZ, a financial services provider for businesses. “They’re really trying to assess how much the 50th employee is going to cost. …Added to that cost are the administrative requirements. Starting this year, all companies with 50 or more full-time workers — even those not yet required to offer health benefits — must file new tax forms with the Internal Revenue Service that provide details on employee head count and any health insurance offered. Gathering the data requires meticulous record-keeping. “These are some of the most complex informational returns we’ve ever seen,” said Roger Prince, a tax lawyer. And don’t forget that while Obamacare discourages entrepreneurs from creating jobs, it also discourages people from seeking jobs. That’s the kind of two-for-one special that’s only possible with big government! Now that we’ve cited examples of bad policy from the Veterans Administration and Obamacare, let’s turn to Medicare for our third example. Veronique de Rugy of the Mercatus Center writes about rampant Medicare fraud in her syndicated column. Medicare is rife with fraud, and every year, billions of dollars are improperly paid out by the federal government’s giant health care bureaucracy. According to the government’s latest estimates, Medicare fee-for-service (parts A and B) made $46 billion in improper payments last year. And Medicare Advantage (Part C) and Medicare Prescription Drug Coverage (Part D) combined for another $15 billion in improper payments. Even more disturbing is the possibility that these numbers underestimate the annual losses to taxpayers from fraud and bureaucratic bungling. According to the work of Harvard University’s Malcolm Sparrow, fraud could account for as much as 20 percent of total federal health care spending, which would be considerably higher than what the government’s figures indicate. None of this should be a surprise. Medicare has a notorious history of waste, fraud, and abuse. But there is a glimmer of good news. There’s actually a program to identify and recover wasted funds. The RAC program is geared toward correcting improper payments… The auditors thus pay for themselves with the money they recoup instead of simply being handed a lump-sum check. That the RAC program has an incentive to reduce wasteful spending and save taxpayers money makes it fairly unusual among government initiatives. Unfortunately, no good deed goes unpunished in Washington. …bureaucrats are set to greatly diminish the program’s effectiveness in 2016. Rather than empower these fraud hunters, they are drastically reducing the number of paid claims that auditors can review every 45 days (from 2 percent down to just 0.5 percent). The new limits will make it that much harder for auditors — whose cost already amounts to just a drop in the bucket — to recoup taxpayer losses. I’ve also written about this absurd effort to curtail the RAC program, but Veronique makes a critically important observation that has widespread applicability to so much of what happens with government. Agency failure is routinely rewarded in Washington with bigger budgets and greater authority, but here success will not be. This, in a nutshell, is the difference between the private sector and the government. In my speeches, I sometimes point out that people in the private economy make mistakes all the time, but I also explain that the incentive to earn profits and avoid losses creates a powerful incentive structure to quickly learn from mistakes. That means resources quickly get reallocated in ways that are more likely to boost economic efficiency and increase growth and living standards. In government, by contrast, this process is reversed. Bureaucrats and politicians reflexively argue that failure simply means that budgets should be expanded. All of which explains why these cartoons are such perfect depictions of government.